Our neat Mini Hockey Set is just great for beginners or for Dad to play on his knees with the kids at home. The hockey sticks are all one solid piece throughout and very durable. This set includes (2) Hockey Sticks, that measure approximately 20" in length. The hockey sticks have a small hole in the handle end so they can be hung up. This set also includes (1) Hockey Puck and (1) Hockey Ball. The Hockey Puck and Hockey Ball are really neat for all types of play - indoor or out! This Mini Hockey Set comes with total of (4) pieces of really nice equipment. 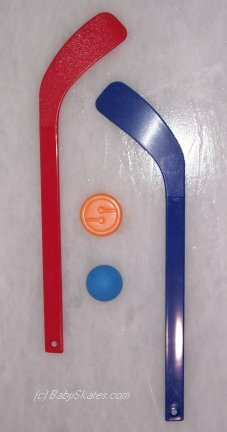 Colors of items will vary in our Complete Mini Hockey Set. This set will arrive in a nicely packaged box that when opened is all ready for great play and action. Don't let the name fool you it may be a Mini Hockey Set, but it is designed very well and ready for a lot of action! This Mini Hockey Set can be used both indoors and outdoors and will work fine for ice hockey or street hockey.